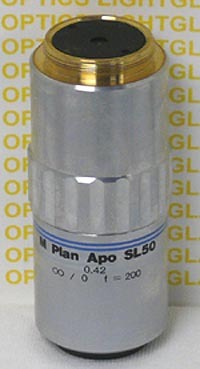 The Mitutoyo M Plan Apo SL50X is a Super-Long Working Distance objective, having a 20.5mm working distance. The numerical aperture is 0.42 and this highly-corrected objective is optimized for bright-field work. It is strain-free and has a very flat field and excellent color rendition. The depth of focus is 1.6mm. This is for Infinity-Corrected systems and is Mitutoyo part number 378-811-2 (or -3).